We are adding features and making updates on a regular basis. You can keep track of what's happening on the Flybrix GitHub Page. This page will help you update the firmware on your flightboard using the simplest method available. Follow the steps below! 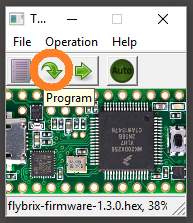 You need to download a small program to download firmware from your computer to your flightboard. Follow the instructions on the Teensy Loader Download Page that correspond to your operating system. Please note that you only need to install the Teensy Loader application. You don't need to download or install the "blinking firmware" examples from the Teensy webpage. Attach your flightboard to an available USB port on your computer using the cable from your kit, and plug in a charged battery. 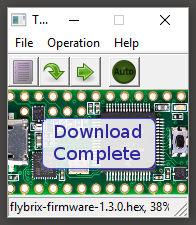 Visit the Flybrix Firmware Releases Page on GitHub. Click to download the HEX file from the latest release. 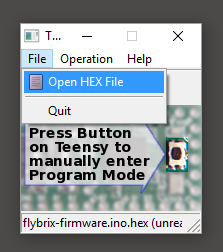 Launch the Teensy Loader Application and select "Open HEX File" from the "File" menu. 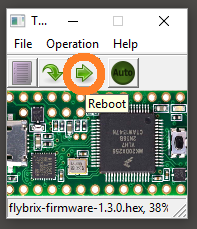 You will find the PROGRAM button near the USB port on the top side of your flightboard. 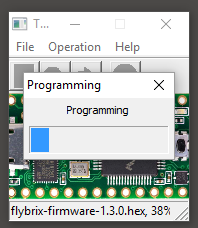 You should see a progress bar as the firmware is copied to the flightboard. The firmware should download with no error messages. 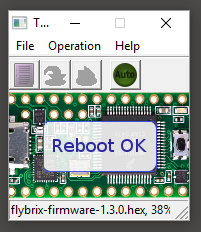 Your flightboard will reboot with the new firmware. Congratulations! Your firmware is now up to date! To confirm that you have installed the latest firmware, unplug and replug your battery and observe the LED pattern when the board reboots. Version 1.5.0 shows one red LED and one purple LED as seen below. * If you happen to get an error message that states the hex file is too large, you may have a faulty USB cable.